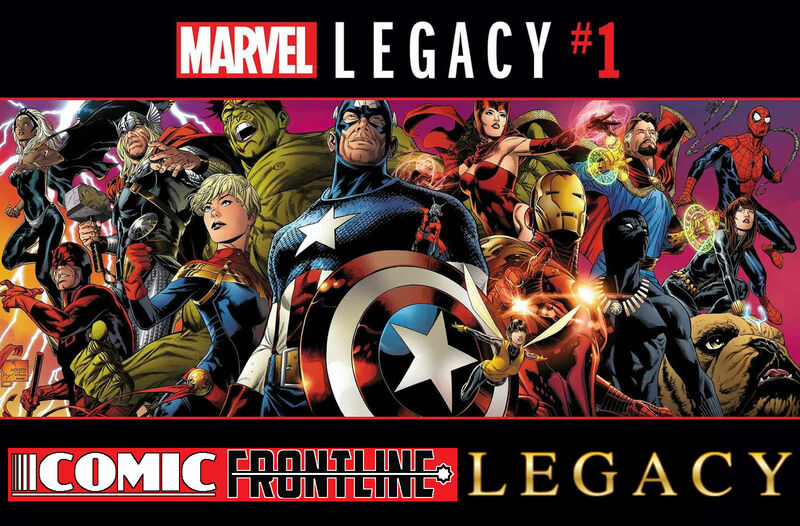 Comic Frontline: Marvel Legacy Covered - A Frontline Commentary! Marvel Legacy Covered - A Frontline Commentary! Marvel has made a lot of promises with MARVEL LEGACY, they told us to get ready for a new dawn — one whose rays will touch every corner of the Marvel Universe! Last week they dropped 52 covers (yes they went there) including 6 exclusive to Comic Frontline, showing us a glimpse into MARVEL LEGACY through homage covers. Some of here on Comic Frontline decided to share our thoughts on them, so check out our thoughts and continue the conversation by adding your thoughts in the conversation. Brant Fowler ~ These new covers revealing the coming titles in this new age of Marvel Legacy are interesting to say the least. I do appreciate the homage to the classic covers of Marvel's past. There are some very telling covers in the bunch too, and it illustrates how Marvel is now paying tribute to its past. For years now, Marvel fans have been wanting some semblance of returned order to the Marvel Universe. And while they can't go back in time and have vowed not to do a straight up "Rebirth" of their line, what they can do is return these titles to more of a status quo longtime Marvel fans are used to. With X-Men Gold and Blue, they did this to a degree, and it was successful. Neither are exactly what we've had before, but in many ways they are very similar. homage covers, some may hearken to very familiar themes from Marvel's past. Like Black Bolt's famous Uncanny X-Men homage cover pointing to the potential threat of extinction for the Inhumans. Or Punisher's War Machine cover showing Frank in an Iron Man like suit. What I also find interesting are some that really hearken back to a title's past, be it distant or recent. Case in point, Luke Cage seems to have returned to his roots, and Hawkeye is following in the footsteps of her predecessor. As for the titles we are getting, most could be expected, but some surprise me that they are sticking around, like U.S.Avengers or Thanos. However, it's nice to see the much anticipated return of Hulk to She-Hulk for Jennifer Walters' book. All in all, I'm not quite excited about the coming changes, but I am definitely more intrigued than I have been in quite some time. How Marvel handles this non-event will make all the difference in my opinion. It'll be fun to see it all unfold regardless of the outcome, though. Amazing Spider-Man Renew Your Vows: Looks like they are making Annie a teen, and as a very big Mayday Parker fan I don’t see the point in this. Hawkeye: This will be returning to a team up book with Kate and Clint. I will miss Kate’s solo adventures, but I do like her dynamic with Clint. The Punisher: Very big changes for the Punisher coming. I don’t know how to feel that he may be becoming War Machine. She-Hulk: I’ve been really enjoying the PTSD story for Hulk, but it looks like with Legacy she will be going back to being the fun loving She Hulk. Spider-Gwen: I’m really excited to find out who will be taking over the Venom mantle in Earth-65. It looks like a female on the cover, could it be MJ or Edie Brock? The Mighty Thor: I’m glad that the series is finally dealing with Jane’s cancer head on. Marvel Two In One: The Thing and The Human Torch: So happy to see these two together again! I hope this means the return of the Fantastic Four in some form. Overall there are some interesting changes to the titles that hopefully bring Marvel towards a good direction for the future. Jay, Comic Book Theater ~ Marvel for the past few years have been pushing fans away by killing off, aging, depowering etc their mainstays and replacing them. Fans didn't like it in the 90s and we don't like it now. Recently DC launched their Rebirth initiative bringing back all the elements that fans have been demanding since the New 52 launched in 2011, and with great success. Marvel felt the backlash with low sales, and now we have their newest initiative, MARVEL LEGACY promising to bring back those classics fans love, while maintaining the diversification of their universe that they spent the last few years building. The covers are honestly a mixed bag, some are brilliant, some are bizarre, and most fall somewhere in between, but all have us talking, that is for sure. From the first set of covers, The Amazing Spider-Man Renew Your Vows has me interested because Annie May seems to have grown up considerably, appearing to be a teenager now. Totally Awesome Hulk has me excited to with a title change to Incredible Hulk and the Return to Planet Hulk on the cover, this is the most excited this book has been since its inception. while the rest (aside from X-Men Blue which I will discuss later) are just there. The second set only have two standouts to be honest and that is Ice Man, for the reunion of the original Champions in a very nice homage that actually gives me hope for the series. The second one is Old Man Logan for the mystery of this "Crimson Samurai", I think he might be the original Silver Samurai's son who we just met. The rest while might be cool looking does nothing that make me have to grab them. Round three save for Champions (which I will talk about later) only has one cover that really has my attention and it is a book that right now that I have been bored with, Spider-Man. I like this new Sinister Six, especially because one of them, Bombshell is currently one of Miles' "Spider-Friends." I am really interested in seeing this face off. The fifth volley of covers give Deadpool a new adjective, and turns the Punisher into a War Machine, I have to be honest the Punisher one has me curious about how he got to that point and hoping it isn't a cover that has nothing to do with the story inside. I am saving the Avengers for later. From the sixth, seventh, and eighth showcases the return of the She-Hulk title has me most interested. Between that and the Return to Planet Hulk in the Incredible Hulk, I think my theory on Bruce Banner's return is becoming more likely. I also like the Spider-Gwen cover and has me hoping this Gwenom is M.J. I am a big fan of the Slingers so to see all four of them around my favorite Spider, Ben Reilly has me super pumped for Ben Reilly: The Scarlet Spider. We also have two crossovers with Avengers and Champions taking on the High Evolutionary, and X-Men Blue and X-Men Gold teaming up Mojoworld. Both have me mildly interested but nothing that makes me running to tell everyone that I can't wait to see them. Now for the grand finale Marvel sent Comic Frontline the final six covers and they saved the best for last in my opinion. We have Ms. Marvel which appears to be taking some heat for her recent political views maybe? Peter Parker behind bars in Peter Parker: The Spectacular Spider-Man. Pak being the only current creator to have their name on a cover with Weapon X. Marvel's Two-In-One: The Thing And The Human Torch comes back with a book for The Thing and The Human Torch, but lacks the Fantastic feel of the First Family. Sam Wilson returns as The Falcon in his first solo title as that character. But the biggest book of all is The Mighty Thor with The Death of Captain Marvel homage, this is very powerful as he died of cancer and as so has become a hero that seems denied access to death's revolving door. This has us all wondering if Jane who currently has stage four cancer dies from it as well and denied access? Overall these covers have us all talking but I think a lot of people who have been burned by Marvel in the past few years during this trial of change are taking a wait and see approach still. I think Marvel needs to pull out a big gun, and that may be the return of the Fantastic Four or something because we already know that Steve will be returning as Captain America and in his old uniform so that isn't going to be the big wow we need.